Every voter in America needs to see this. Share it if you care about the quality of democracy. An INDEPENDENT review, please note. 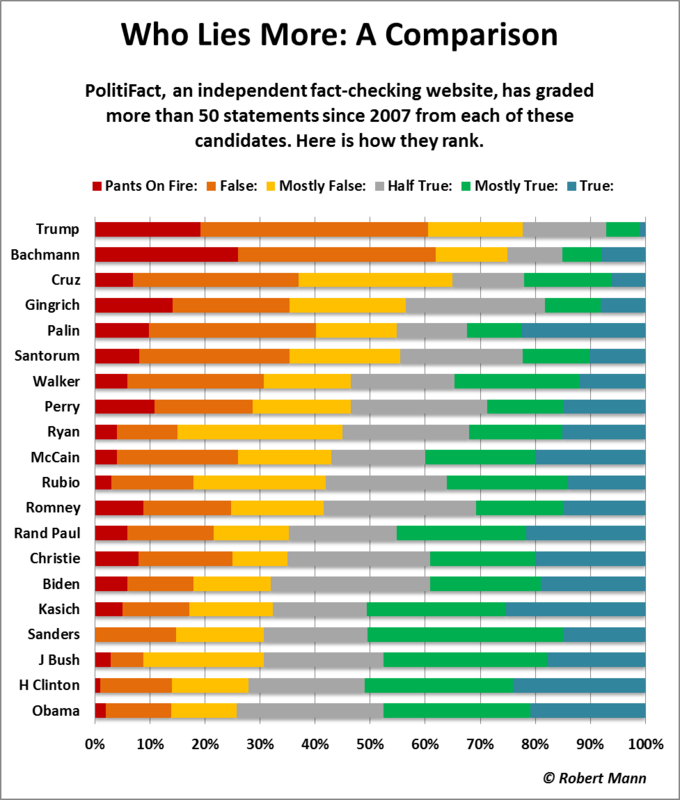 What should concern anybody with half a brain is that a sitting President has scored over 50% of what he has said as containing at least an element of untruth in it. I agree that this is a huge condemnation of the whole American political establishment. But what is clear is that the “anti-establishment interloper” is the biggest liar of all, and the worst liar. In a nation with any semblance of civil society left he’d be disqualified from standing a dozen times over. I think if a similar study was done of past elections, you would see the ‘opposition’ scoring higher on the, er, ‘creativity scale’ than a sitting government. I am not saying that is the way it should be but it most certainly is the way it is. I would love to see a graph like this for the last 10 elections. Now you settle down, Yolly. Keep your ‘facist’ and ‘evil’ words locked away if you feel it necessary to discuss Mr Trump. And don’t forget to balance what you say about him with what that nice Mrs Clinton has been up to. I believe Trump is an anti-democrat anti-politics fascist. You will not convince me otherwise. He has no respect for the institutions of government or democracy. And no I am not kidding. Clinton isn’t perfect, but she is sure as hell head and shoulders more desirable than Drumpf. I am sure we can agree to disagree. Having been watching American politics for quite a few years now, I can’t quite believe that the top fourteen don’t have the red ‘pants on fire’ for a full three quarters of their statements! Yolly, you are quite correct in what you say about Trump too. You know, the Hillary-haters have had 24 years to spread every lie they can think up about her, and smear her in any way possible. Yet Darrell Issa and Trey Gowdy, both of whom hate her passionately, both of whom had all the resources of the U.S. Congress at their disposal, were unable to come up with anything to charge her with. The FBI was unable to find anything to charge her with, though its director indulged in unprofessional innuendo. Isn’t it possible that, as Jill Abramson said in the Guardian in March 2016, that she is “fundamentally honest and trustworthy”? You can check out Abramson’s career on Wikipedia, but to summarize it, she was actively involved in journalism with a specialty in Washington DC from 1988 until 2014, when she was (controversially) fired. She was with the Wall Street Journal first, and then the New York Times. She is, as she puts it, “not a favorite in Hillaryland.” Be fair. Give it some thought. I am sure Hillary is not half as bad as she is painted by the right. She is, though, also a “machine” politician, at a time when that is the last thing a lot of Americans want. I am one who watches from without – I live and vote in UK – and I really don’t know what you can take home from this, except possibly that honest people don’t get elected. It’s the same in UK, though less celebratory in nature. Over here the political class have a firm belief in their right to tell the electorate whatever they think we want to hear, because they place no worth in us whatever. We simply exist to feed the machine. This is what dysfunctional looks like. Civil war breaks out in the Republican Party.